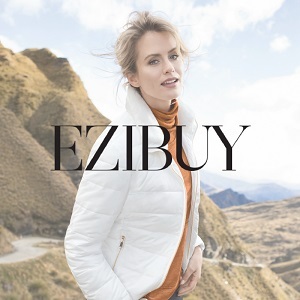 If you've been following my recent trip to the US across social media, you will have already discovered that I was lucky enough to shoot with some of my favourite brands while abroad. I will be doing a 'shooting in LA' post later this month but before this I wanted to share with you a super brilliant shoot I had just days before we jumped on the plane. Armed with heaps of Unique Vintage outfits and Iron Fist shoes, L12 Photography and I headed to some adorable local locations and shot up a storm with my absolute favourite styles! So sit back, make a cuppa and prepare for one photo packed post! Every now and then and item of clothing enters your life and you feel like you've not lived to the fullest without it. 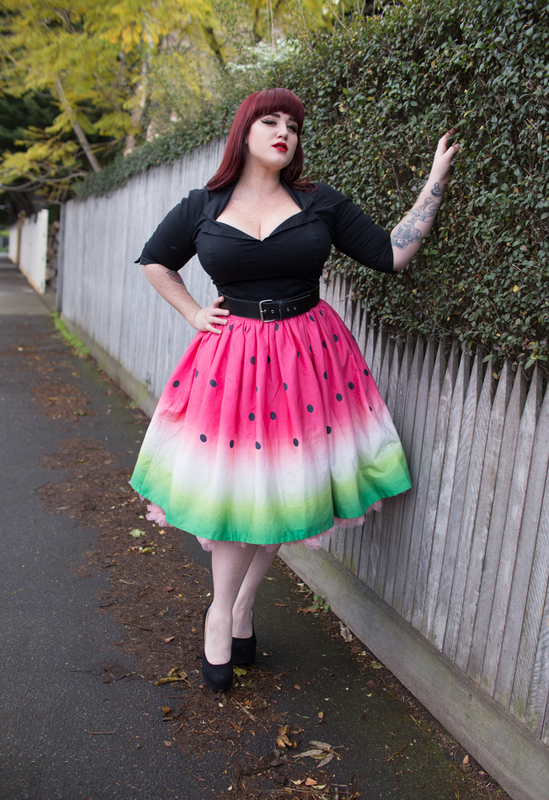 This item has to be the stunning Watermelon Circle Skirt from UV. There is something absolutely magical about this watermelon print and I can honestly admit that I'm crazy for this swingtastic skirt! The layering of colours is what grabs you firstly with this print. I've seen fruit skirts all over the retro world but this is something magical about this style. Now this style was new to me at UV so I opted to get the 2XL for my waist measurement of 34 inches and there is still some room to move. The fit is super comfortable with or without a corset (yes I'm wearing one in this whole set of images) and I've worn this outfit so many times since the shoot! It has a zip at the back and one single button to hold everything in place, plus the extra bonus feature of pockets. Designers know our love for pockets on swing styles and I'm loving the extra details added these modern reproductions styles. I paired this skirt with my beloved Doris top in black and a thick waist belt. You could wear any of the colours featured within the skirt but I loved making the print the main focus with all black accessories. For extra volume I added the stunning coral Hell Bunny petticoat from Inspired Insanity and I love how the soft pink pairs with the green. After loving the fit of this skirt I had the pleasure of modeling a few more spooky prints for Halloween and I can't wait to get my hands on them asap! 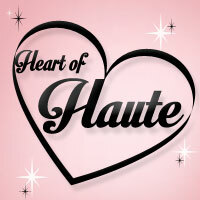 I'm inspired to shoot some super cute pinup horror themes this year. From a huge pop of colour to something a little more work and every day friendly. The Vivien Skirt is a sleek and super soft swing skirt that you will love in your work wardrobe. A perfect length, shape and fit (although the waistband is a little firmer than the previous skirt as it's a size down but it's still a great fit) and the look - completely sophisticated without any effort. 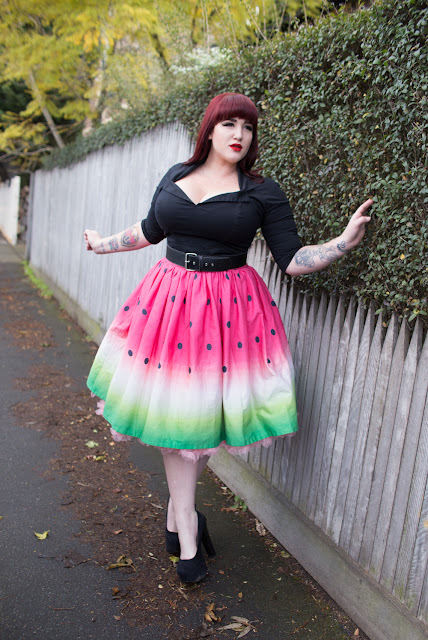 I'm wearing the XL here petticoat free as I think the fabric does not really work with such layers beneath and I love how it skims over my hips and draws focus to my waist, I usually have an issue with hidden pockets and my hips but with this style and fit there are no issues! I paired this outfit with what have to be the most adorable Mermaid themed pumps from Iron Fist Australia. 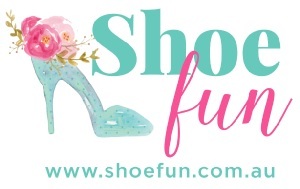 If you've followed my blog from the start you will know that I've always had an IF addiction as they make the most creative and stunning footwear and clothing. I love a shoe that makes an outfit pop and IF are definitely able to do that with their prints, themes and unique shapes. I chose the Midnight Mermaid shoe to pair with this look as the colours really work together and the print draws your eye straight to my pins! 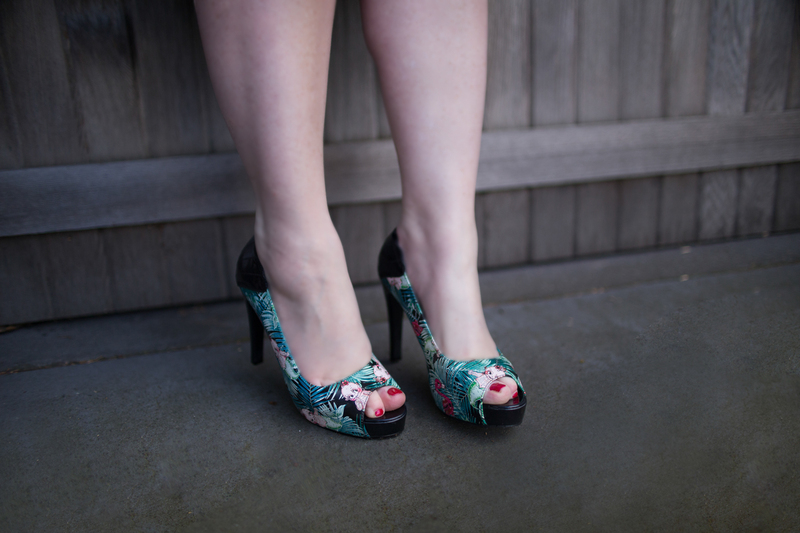 With a super high yet comfortable heel, adorable black iridescent shell applique and a open toe you can wear these babies all year round and I can't wait to style them with more nautical themed looks this summer. Size wise I went with a 10 and I found these a little tight but I own many 10's in this style from years gone by. With a size up I think I'd be more comfortable mainly in the toe area. Can we just take a moment to have a good look at the adorable little baby mermaids hidden in this print? So cute! I'm a sucker for gingham and when I saw the San Vicente Swing Dress I knew I had to try it asap to see if it would work with my shape. I'm really not a halter style girl and that's mainly due to being a GG cup, to be honest I've not worn a halter since I was a D cup! But this style is flattering due to the higher cut neckline and thicker fabric. I might have cheated and worn my normal bra with this but as I wear cardigans constantly it never shoes and I have no fear about having halter or strapless bra issues. I'm wearing this style in an 2XL and I could honestly fit better in a XL as there sheering at the back offers so much stretch and without a fitted belt or cardigan it's actually a little roomy on my waist. So if you are usually an XL in stretchy items like me I'd stick with that size as there is lots of room to move with this style. Pictured without a petticoat I love the fit and flow of the skirt and the fabric is great for traveling as you never have to steam or iron it. This was a huge time saver on my recent trip. What's this? Yet another halter? Yes!!!! I could not help myself with these styles I just had to have them and I'm so glad I broke out of my 'say no to halters' mindframe as this has to be one of the most comfortable and adorable dresses I've ever owned. Now like the last style I'd really like to size down to the XL for a firmer fit at the waist. I was not 100% sure of the fabrics but now that I've worn this many times I can tell you to size down. The top half is a super soft and stretchy so it was at great fit at my chest but roomy at my waist. Then the skirt is non stretch but due to the swing style shape it fits up to any hip size. The bottom half of this skirt is a showstopper and when I arrived in the US I wore this on my first day at Disneyland! I received so many compliments and due to the flowing soft fabric I was cool and comfortable all day. The skirt is also fully lined so you won't have any issues with see through fabric. You may have seen this style pop up on my blog before and that's because it's a brilliant fit! The Delores is one of those styles that I make grabby hands at my computer screen every time a new colour way is released. It checks all of my dress needs boxes with 3/4 length sleeves, a pleated and low cut bust and a fitted waist. I'm wearing the Delores in an XL and this is my go to size always in the this super stretchy fabric. I'm also loving the bright blue/turquoise colour of this fabric combined with the most dainty small polka dot print. 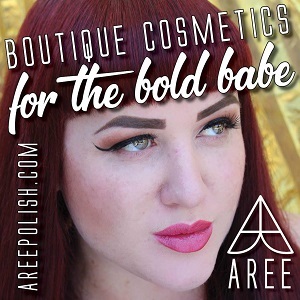 It works perfectly with my pale skin and dark red hair. While I'd usually go for a black petticoat beneath a dress of this colour I chose navy blue this time and I really love how well it works together. It adds as softer mixture of colours and compliments the brighter blue fabric perfectly. Now the Darcy dress is a completely new style to me but I wanted to try this after all of the great fits I'd had with other strapless styles from UV. This style does come with detachable straps so don't discount this stunning frock if strapless is not your thing. I'm wearing the Darcy in a 2XL and I really love the super firm fit! It's not as stretchy as other garments I own from UV but I think the thickness of the fabric and structure are due to it being a strapless style. The fabric is amazing in person and really pops when paired with a rich red cardigan. I felt like snow white in this look and loved it! This style is currently sold out in all larger plus sizes but there are some 2XL's left so get shopping asap! 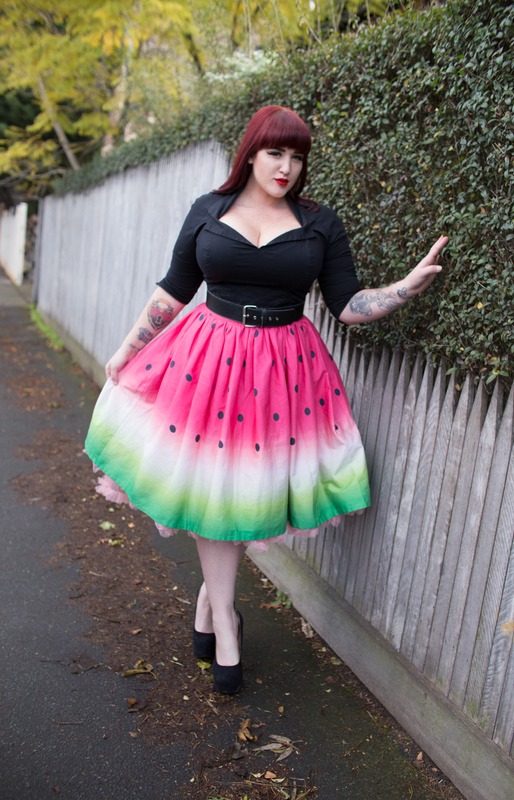 Hopefully this returns in other prints as it's a perfect spring/summer dress for Australian pinups. After showing you all my favourite swing styles I had to try the Broadway stretch wiggle dress! As this is the year of trying new styles I wanted to see how I'd look in a higher neckline super tight wiggle dress and the result is - I can rock it!! This wiggle is adorable! From the pleated ruffle flounce to the knitted top and peter pan collar the Broadway dress fits like a dream and really does flatter a curvy figure. I opted to try this style in and XL due to the stretchy fabric and it's perfect. The fabric is that strong and thick it's also acts like shapewear holding everything in like shapewear and that's the sign of a perfect fabric. Now this style is sleeveless and as you know I'm not a huge fan of my upper arms but my husband recommended pairing this with my Deadly Dames Moto Bolero and the results are perfect. I think my lovely man has been absorbing a little too much of my fashion talk and has stylist dreams - love it! I paired this outfit with my absolute current favourite style and Iron Fist Australia Kind of a Freak Wedges! These stunning day of the dead inspired shoes are super tall, have a stunning floral embroidery all over the black velvet wedge and the text 'FREAK' adorns each back heel. If you look closely at the top of the back heel you will find a super sweet little white skull as well. I own this style in leopard print with a huge red heart saying 'Love Kills' at the back and I thought that they were my favourite shoe but the freaks have won me over! With the combination of black, red and green, bold text, studs and skulls these are my current favourite shoe and I can't wait to keep styling these over the next few months. I'm wearing these in an size 10 and they are a perfect fit so it's just a little bit of trail and error with some styles it seems. If it's a tighter fit I'll need an 11 if a standard I tend to go with my usual 10. Now that I'm back home I can't wait to wear these out on the town and pair with with disco pants and leather! Many thanks to the amazing Liz from L12 Photography for working so hard on this super fast last minute shoot! I have one more outfit/post from this day coming up asap so keep yours eyes peeled for that one. I also can't wait to get my hands on more Iron Fist styles next season as they keep blowing my mind with their unique creations.